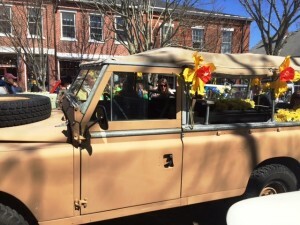 Tomorrow, Saturday April 29th the island will be decorated in daffodils, and Main Street will be full of people in festive yellow attire and antique cars as part of the 2016 Nantucket Chamber of Commerce Daffodil Festival. Nantucket’s annual Daffodil Festival takes place each year the last weekend in April and is the island’s (unofficial) kick-off to spring. “Envision Nantucket was launched by the University of Florida’s Historic Preservation Program in 2012, as part of the Envision Heritage initiative, which explores how new and emerging technologies can be used to document, interpret, and manage heritage sites, landscapes, buildings, and interior spaces. This program is supported by the Osceola Foundation and the Nantucket Community Preservation Committee. NPT has been a partner, assisting the Preservation Institute: Nantucket with the program on island. Laser scanning is a highly accurate and efficient means to create a spatial database of an existing site and can be used to generate other work products. This technology greatly reduces the time and increases the accuracy of recording historic landscapes, sites, buildings, and interior spaces. The 3D laser scanner sends out a laser beam that collects data by measuring the distance of the beam to objects in space. The scanner assigns distances to these objects by calculating the time of flight of the laser in relation to the known speed of light. Multiple scans are used to collect data from many vantage points, and these scans are then combined into a single virtual 3D model. From the 3D model, many types of representational products can be created, including: photo-realistic perspectives and orthogonal views (site plans, floor plans, sections, and elevations), line drawings that meet the Historic American Building Survey (HABS) standards, and animated digital walkthroughs of the site.